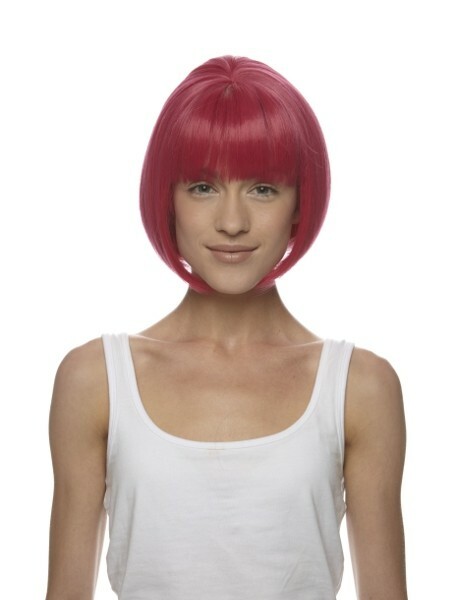 Our premium Synthetic wigs attach in less than a minute; build volume, hide thinning hair or bald patches or simply just have some fun and give yourself a new look in seconds. Also ideal for parties, fancy dress and festivals. 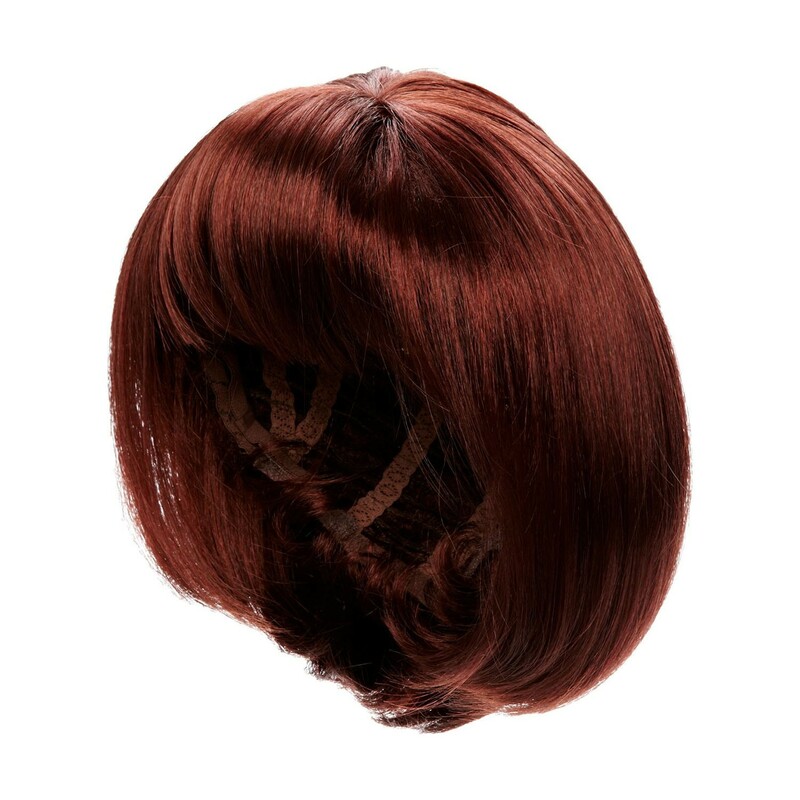 The Tanya Wig is a shoulder-length silky straight bob wig with a fringe. It comes in lots of natural colours as well as fun funky colours too! 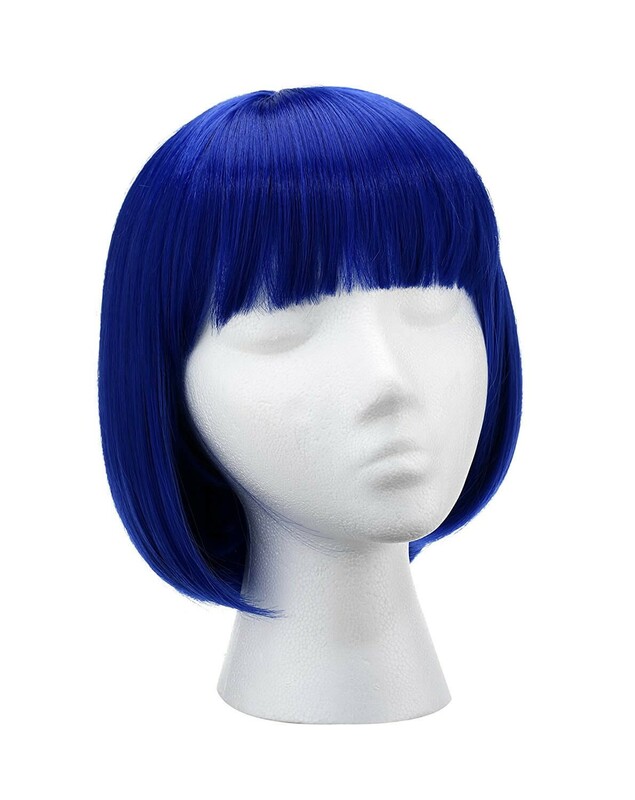 This wig has been machine made and is pre-styled. 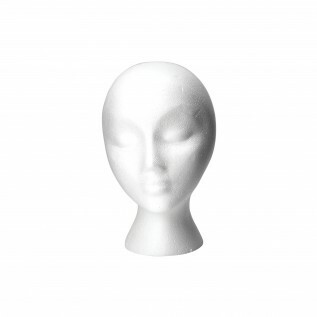 Crafted using several wefts sewn together, it’s the cheaper alternative to hand knotted wigs. 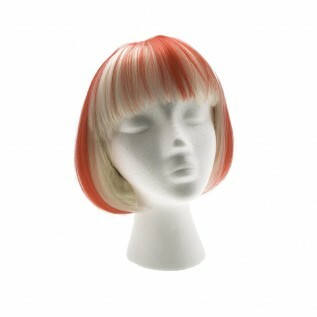 Why not support England with our great Tanya England Wig. 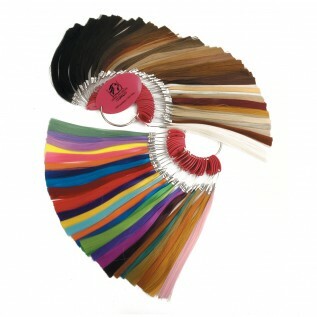 Use the 100% Premium Synthetic Colour Chart to colour match your hair. Loan or Buy one now. Or send us in a snippet of the hair you would like us to match up for you and we can do that for you. 1. Extensions should be washed as infrequently as possible for best durability and to prevent damage to the hair’s protective silicone coating. AMERICAN DREAM recommends washing once a week with its low pH Soft and Silky or Manhattan range shampoos. 2. Lather shampoo in your hands then gently apply to the hair, taking care not to massage vigorously in particular around the bonds/attachment points. 3. Rinse gently but thoroughly with lukewarm water. 4. Apply our Soft and Silky Conditioner or our Manhattan Conditioner to the mid-lengths and ends, not on the bonds or the scalp. 5. Rinse gently but thoroughly with lukewarm water. Silky Straight – 1. Brush or comb using our lonic Brush or Comb specially designed for hair extensions. 2. Leave to dry naturally or blow dry using a mid-heat. 3. To keep your extensions looking new and glossy every day, use our Soft and Silky Spray to detangle and add shine. Wavy – 1. Push hair upwards to reform the curl. 2. Leave to dry naturally or for extra volume and speed in drying use a diffuser. Use a wide tooth comb to style. 3. To keep your extensions looking new and glossy every day, use our Soft and Silky Spray to detangle and add shine. Curly – 1. Push hair upwards to reform the curl. 2. Leave to dry naturally or for extra volume and speed in drying use a diffuser. Use a wide tooth comb to style. 3. For a deep wave effect, set the body wave in size 40mm rollers and dry under hood dryer. When dry remove all rollers and brush into deep waves. 4. To keep your extensions looking new and glossy every day, use our Soft and Silky Spray to detangle and add shine. 1. Brush or comb using our lonic Brush or Comb specially designed for hair extensions. 2. Leave to dry naturally. 3. To keep your extensions looking new and glossy every day, use our Soft and Silky Spray to detangle and add shine. 4. You can use heat appliances up to 170°C. 5. Do not colour. 1. Brush or comb using our lonic Brush or Comb specially designed for hair extensions. 2. Leave to dry naturally. 3. To keep your extensions looking new and glossy every day, use our Soft and Silky Spray to detangle and add shine. 4. Do not use heated appliances. 5. Do not colour. 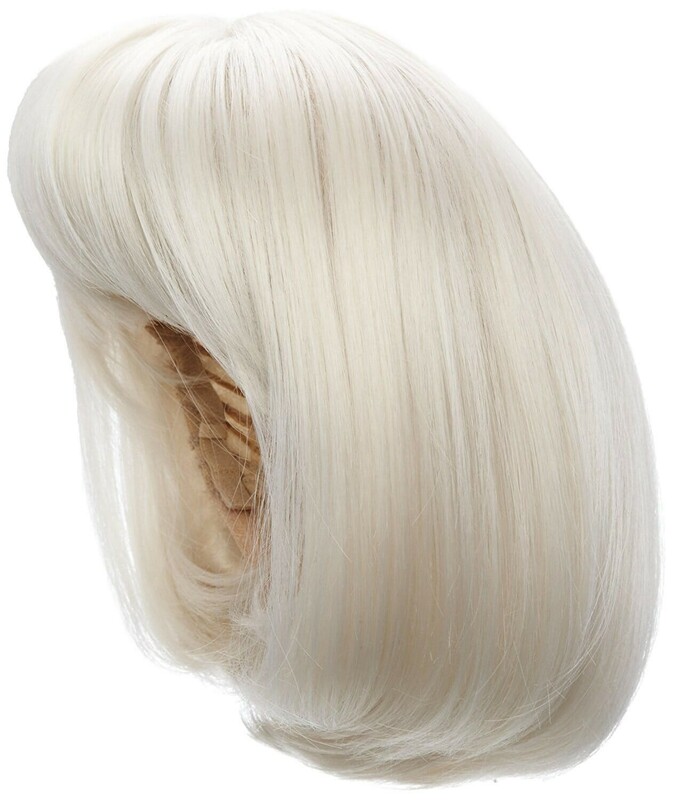 Silky Straight – 1. Before going to bed braid your hair into one loose large braid at the back of the neck. 2. Upon waking undo the braid and gently comb through from the mid-length to ends. Wavy and Curly - 1 & 2. As above. 3. Upon waking spritz the hair with water to dampen and push hair upwards to reform curl. All hair types – 1. We do not recommend swimming with hair extensions as chlorine and sea water can damage the hair’s silicone coating. Note: Curly or Wavy hair extensions can lose their style after swimming. All hair types – 1. Tie or braid hair into one loose large braid at the back of the neck, do not wrap in a towel. 2. After sauna keep head out of the shower to prevent bonds from slipping. 3. Leave to dry and cool down naturally. 4. Wash and style as above. All hair types – 1. Tie or braid hair back. 2. To prevent bonds from slipping, wait for hair to cool before letting the hair down. 3. Wash and style hair as above. All hair types – 1. We do not recommend dying any hair extensions. 2. For a root touch up of your own natural hair please consult your professional stylist. We use reputable 3rd party delivery companies to ensure your order reaches you safely. Note: If your item is lost or stolen in transit, the carrier company will be responsible for compensation claims. Please be aware that someone will need to sign for the delivery of your purchase between the hours of 9am and 6pm. Failure to provide an address where someone can sign for your goods, or requesting a delivery address to be changed while your goods are in transit, will result in extra delivery charges being made. Goods will not be left with a signatory. All orders placed before 1:00pm Monday-Friday will be dispatched on that day. Any UK Next Day deliveries placed before 1pm will be delivered on the next working day. Orders placed on weekends & bank holidays will be processed the next working day. Orders will be delivered wihtin 10 working days. This is pending Customs clearance. Returns must be made within 7 working days for a full credit note. No refunds will be given. This is a Business to Business trade website and any sales form a contract under those terms. Click here for full terms & conditions. The items returned must be in their original condition, which includes all un-tampered packaging. Do not remove the hair from the backing card as this will invalidate any return. All goods will be inspected on return. We recommend that you return your item by First class Registered post to ensure that it reaches us safely and within 7 working days. Please note it is very important that when you return an item, we know the order number it relates to and your details. Complete the Returns Form that is in your parcel or download a Returns Form here. Without these details we won't be able to take the action you want us to. Once we receive them, we will inspect and process the goods to ensure you receive what you want as quickly as possible. If you feel there's a manufacturing fault with your goods, please return them and include proof of purchase and covering letter detailing your experiences with the product and any packaging or further information that you think may help us. If you are returning hair, this may need to be sent to our laboratories overseas for testing, so results can take 6-8 weeks to determine. The goods are your responsibility until they reach us. Please ensure you package your return to prevent any damage to the items or boxes as un-saleable items cannot be refunded or exchanged. We recommend you use a postal service that insures you for the value of the goods you are returning.